Acuvue Advance for Astigmatism lenses are to be discontinued by the manufacturer on 31st Dec 2015. 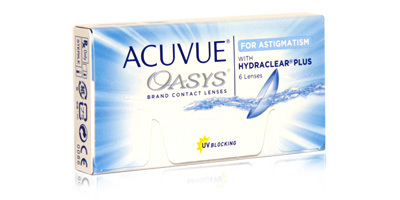 The alternate upgraded lens is called Acuvue Oasys for Astigmatism. 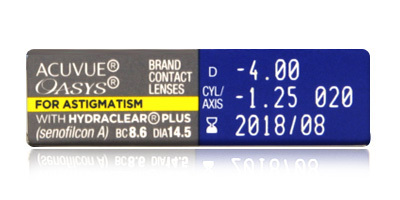 Do you need a dependable, durable and comfortable toric lens that stays in position and supplies consistently clear and sharp focus in all conditions? 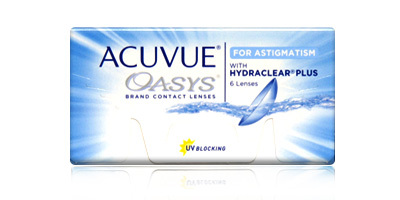 Acuvue Advance for Astigmatism contact lenses are a great place to start. These bi-weekly disposables offer the impeccable vision supplied by glasses and freedom from cumbersome cleaning routines demanded by monthly disposable lenses. Made by household name Johnson & Johnson, Acuvue Advance for Astigmatism lenses offer crisp vision and eye health benefits. Made from a highly wettable silicone hydrogel material, they have a smooth and natural feel and allow oxygen to permeate to the eye easily. In addition to a natural moisturisation system, these two weekly disposables feature UV blocking to protect eyes from the harmful effects of the sun�s rays. Johnson & Johnson�s unique Accelerated Stabilisation Design enables Acuvue Advance for Astigmatism lenses to settle quickly and stay in position all day. No more irritating slipping and interrupted vision! You�ll forget you�re wearing them moments after application. 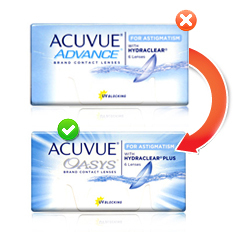 Inserting Acuvue Advance for Astigmatism toric lenses is simple, fast and painless thanks to an inside-out indicator. A light visibility tint and a clear edge make them easy to see, in the blister pack and out of solution. Johnson & Johnson Acuvue Advance for Astigmatism lenses come in boxes of six and are available in powers from -9.00D to +6.00D. 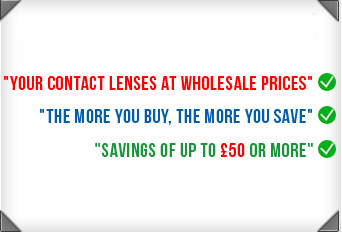 For advice on selecting the right contact lenses and to ask any questions regarding our orders, delivery and returns services, call our friendly and knowledgeable team on freephone 0800 037 4000. 98% of contact lens orders leave our warehouse the same day. If you need your lenses super fast, choose express delivery. Excellent service, very friendly and helpful customer service who were more than willing to help me after I messed up my order. No complaints at all, I will certainly be ordering again!